CONGRATULATIONS to Zack Pang! He defeated his opponent Dennis Kam with a reverse arm lock from the cross-side position @ 2:20 in the 2nd round. There was a heckler from the other team who tried to get in Zack's head with a lot of trash talk, but it didn't phase Zack at all. We will post the video Nora took later. The dojo is almost out of water bottles to sell, so please bring your own drinks to the dojo tonight. Don't miss out on learning from Rylan's teacher. Pedro is a close & long time friend of the Gracie family. Relson Gracie himself "might" be in attendance there that night. Message me for guest list! And please don't try to get me trashed. I WILL give away your drinks. congradz to teamHK naga participants. Mike thank you for our team rash guards. Good luck to all Relson Gracie Jiu-Jitsu Team HK competitors! All memebers make sure to wear your Black Team shirts, if you don't have one just wear your yellow one. The other Relson schools will be wearing their team shirts too so please try to sit with them as one big team. Be on time today & be there no later then 10am for the rules clinic. Meet half way up the hill at 6pm tonight. Team HK members please wear your "Black" Team shirts to the tournament on Sunday. If you do not have a Black Team shirt just wear your yellow one. Also please wear your yellow team rash guards if you have them. Don't forget that tonight is movie night at the dojo after practice. We are gonna watch Berry Gordy's The Last Dragon. See the other post below for more details. Don't miss out on learning from Rylan's Teacher. Pedro is a close & long time to the Gracie family. Relson Gracie himself will "probably" be there too! This Wednesday night after class we will be starting Movie Night. 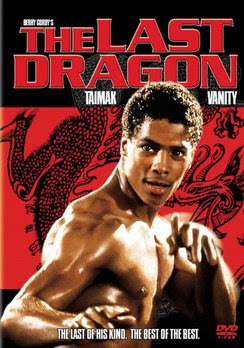 The movie Brian & Todd have picked is Berry Gordy's The Last Dragon. We will start the movie at 9pm so that everyone will still have time to workout after class is over. If you want to bring food or snacks that is okay. You can also order food from downstairs and bring it up, but be sure to do it before they close at 9pm. Team HK is gonna meet at 6pm today to run Wilhelmina Rise again. Anyone is welcome to join us. Meet us half way up the hill. Make sure you to register yourself online today. Today is the deadline for the pre-registration. 23 people showed up yesterday for the Makapu'u "secret" trail hike lead by Dimitri. It was a long exciting hike. There was sun, fun, suspense, & exercise during the 4 hour adventure. Pictures & video will be up soon. Come join us hike the Makapu'u trail today. All information can be found in the post below made by Maile.